If you are planning to preserve capers from your own garden, first be absolutely certain it is a true caper plant. Euphorbia lathyris, common name caper spurge, is a poisonous plant with buds that are often confused as capers. Ingestion of caper spurge buds can cause burning of the mouth, nausea, paleness, irregular pulse, dizziness, delirium and fainting. Contact your local Cooperative Extension Service for assistance in identifying your plant. If you do have a true caper plant, make homemade capers using this recipe as a guideline. Harvest flower buds before they begin to show any color prior to opening. Due to the brining used to preserve capers, it is generally recommended that you rinse capers of excess salt and/or brine before using in your recipe. Gently blot dry with a paper towel. Those on sodium-restricted diets should avoid capers. Capers packed in brine should be kept submerged in their liquid in an airtight container. Store in the refrigerator and use within 9 months. 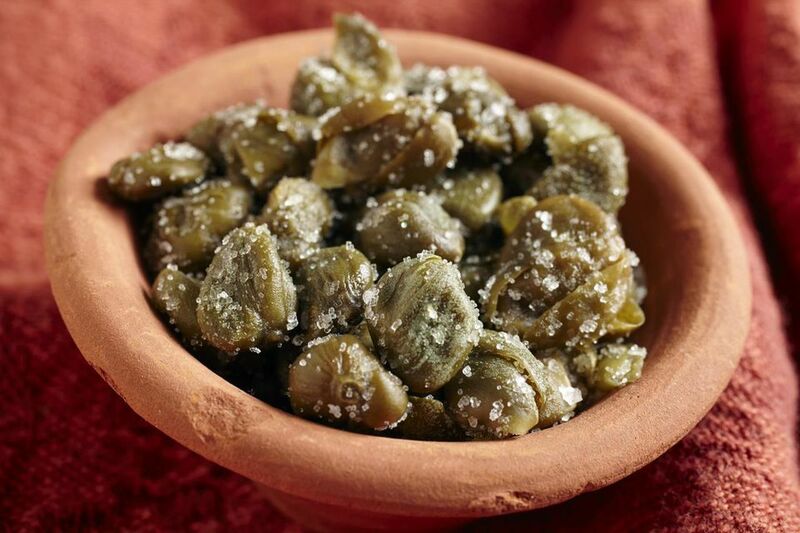 Capers packed in salt may be kept at room temperature up to 6 months, but must also be kept airtight. You may wish to chop larger capers before adding to your dish. For best flavor, add capers at the end of the cooking process. Capers are exceptional with seafood and pasta. They also go well with salads, sauces, stews, vegetables (especially tomatoes), pizza, eggs, poultry, and meat. Some of the most popular uses of capers include tapenade, scalloppine, and remoulade sauce. Brined or pickled nasturtium seeds can be substituted for capers measure for measure if need be, but understand that they will have a more mustardy flavor.